Let me introduce Zurin from Malaysia to you from Cherry On a Cake, I recently started reading her blog, its warm and friendly and filled with great food, this one caught my eye as I had never heard of it before. So yep you know what's coming I asked her for the recipe to share with us. Zurin says this can be used as an appetizer, a side dish or even a sandwich filler. It is often a topping for rice or can be used in the way you next create! Store in an airtight container and in the refrigerator. It will last for a few weeks. Has anyone ever had or seen this before, I want it on top of fried rice yummy! That is a favourite snack of mine, it looks just like shop bought version! I have never heard of fish floss, but it sounds delicious. Im familar with all of the ingredients except galangal. There also chicken or pork floss available in Chinese market. Zurin's blog is indeed interesting. Chicken floss is also very popular here. It's delicious too. I have never heard of this but with the coconut milk and all those spices, it looks amazing! And pretty easy to make. Great guest post. 3 Hungry Tummies: It caught my eye and I had to know about this! Anncoo: oh cool it comes in all flavors! I've never heard of fish floss. What an interesting dish. If you can't find lemon grass and galangal, do you have any suggestions for substitutes? I know my market in the mountains won't have either one. I always enjoy your guests. Thanks for introducing us to Zurin. There are so many foods around the world that I'm not familiar with. This sounds delicious..A wonderful post ..Thanks Rebecca and Zarin !!! Ha, another knew thing you have shown us, how cool. I will ask a friend of mine when I return home if she makes it. Her husband works with my hubby and I am taking a voyage into more Asian recipes when I return! This is the first I have heard of this but the ingredients sound delicious. Definitely worth trying! Pei Lin: oh cool love this stuff! This is quite an intriguing recipe! It sound delicious! I haven't heard of this but it does sound easy and delicious. Very different! I love trying new foods. First time I hear about fish floss look as a glorious appetizer!! Crunchy fish floss sounds good. I have never heard of it before. I'm always up for trying something new. Thanks for stopping by and visiting my blog! I've never heard of this, but it does look good, and is just what I need to get me out of my cooking rut! Galangal is a kind of ginger..im quite sure you wld be able to get it at ur asian store...if you can't, the recipe would still work without :) tq for ur interest. you cld omit the galangal as it wont do the dish any harm but you may sub lemon grass with a few squeezes of lemon juice altho lemon grass does have its own distinct flavour. I hope that helps. :) thnax for asking. I've never heard of this - but my husband will do anythingfor tuna and this is a grand, taste-filled recipe that is accessible. I've heard of it but never knew what it was! It looks incredible! 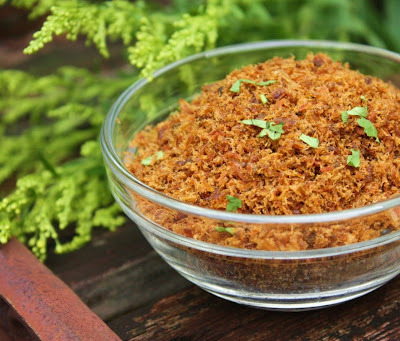 I love pork floss...I think i'm gonna love this too..